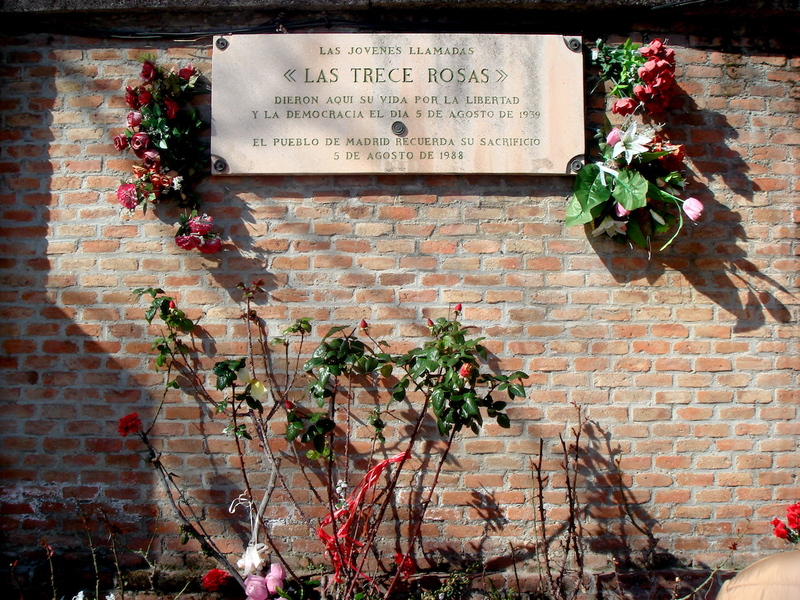 Don Francis de Sallesar y Corvetto, a native of Murcia, where his father was regidor, was on Friday publicly degraded at Madrid from the rank of nobility, had his tongue and his right hand cut off, and afterwards was hanged. His crime was assassinating some persons, and having formed the horrid design of laying his sacrilegious hands upon the king and the royal family. 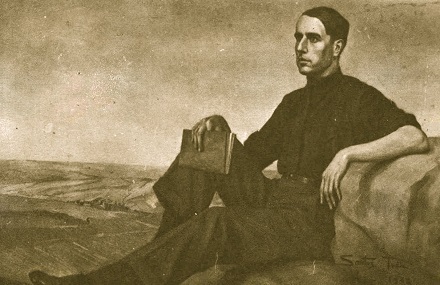 On this date in 1940, Cayetano Redondo was shot at Madrid’s largest cemetery. 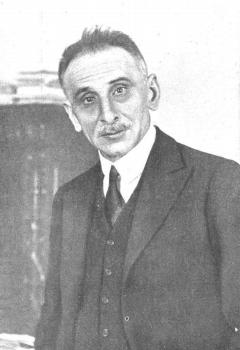 Cayetano Redondo (English Wikipedia page | Spanish | Esperanto), a former journalist and editor, was the socialist onetime mayor of Madrid — having ascended that position during the Spanish Civil War when the previous mayor fled for Valencia as Franco attacked Madrid. Redondo was the guy with his name on the letterhead during the bloody November 1936 Battle of Madrid, when the Luftwaffe tried out terror bombing (Guernica followed in April 1937). 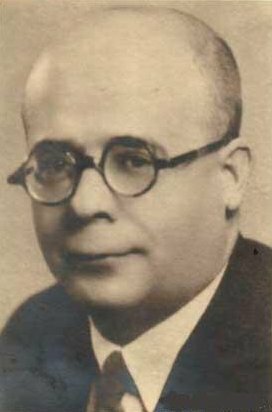 This “hombre de una bondad inagotable” (Manuel Albar, quoted here) was also a leading esperantist — an advocate of building international solidarity through the extension of the constructed language Esperanto. Though Redondo was long a neglected figure, the Madrid city council recently named a street for him. So he’s got that going for him. This signal event needed every drop of sunlight from the long summer’s day. 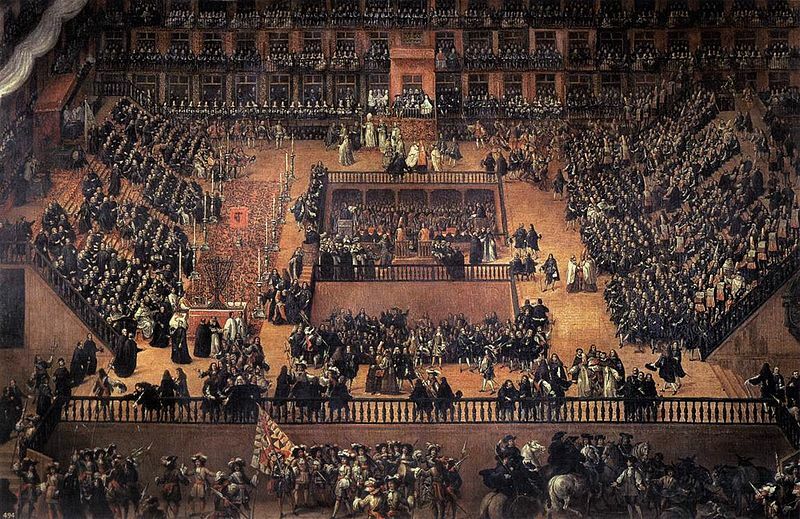 Staged for the appearance of the royal family itself, it likewise pulled in every available case from around Spain: the regional cities shipped their apostates and heretics to Madrid to dignify the main event with a suitable quantity of prey. 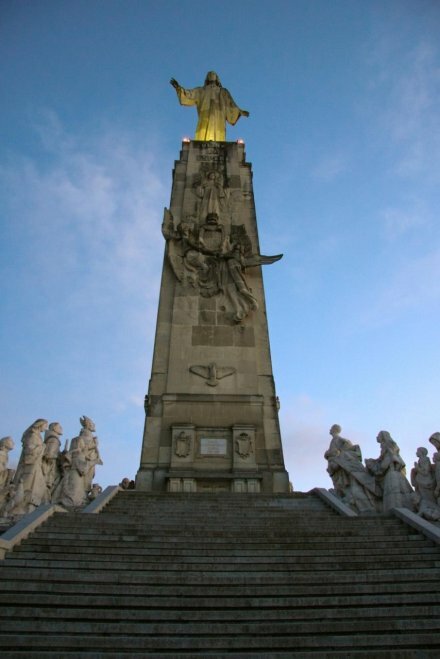 A scaffold, fifty feet in length, was erected in the Square, which was raised to the same height with the balcony made for the King to sit in. 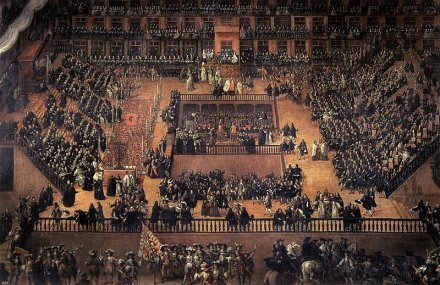 At the end, and along the whole breadth of the scaffold, at the right of the King’s balcony, an amphitheatre was raised, to which they ascend by twenty-five or thirty steps; and this was appointed for the Council of the Inquisition, and the other Councils of Spain. Above these steps, and under a canopy, the Grand Inquisitor’s rostrum was placed so that he was raised much higher than the King’s balcony. At the left of the scaffold and balcony, a second amphitheatre was erected of the same extent with the former, for the criminals to stand in. A month after proclamation had been made of the Act of Faith, the ceremony opened with a procession [on June 29], which proceeded from St. Mary’s church in the following order. The march was preceded by an hundred coal merchants, all arm’d with pikes and muskets; these people furnishing the wood with which the criminals are burnt. They were followed by Dominicans, before whom a white cross was carried. Then came the Duke of Medina-Celi, carrying the Standard of the Inquisition. Afterwards was brought forwards a green cross covered with black crepe; which was followed by several grandees and other persons of quality, who were familiars of the Inquisition. The march was clos’d by fifty guards belonging to the Inquisition, clothed with black and white garments and commanded by the Marquis of Povar, hereditary Protector of the Inquisition. The procession having marched in this order before the palace, proceeded afterwards to the square, where the standard and the green cross were placed on the scaffold, where none but the Dominicans stayed, the rest being retired. These friars spent part of the night in singing of psalms, and several Masses were celebrated on the altar from daybreak to six in the morning. An hour after, the King and Queen of Spain, the Queen-Mother, and all the ladies of quality, appeared in the balconies. At eight o’clock the procession began, in like manner as the day before, with the company of coal merchants, who placed themselves on the left of the King’s balcony, his guards standing on his right (the rest of the balconies and scaffolds being fill’d by the embassadors, the nobility and gentry). Afterwards came thirty men, carrying images made in pasteboard, as big as life. Some of these represented those who were dead in prison, whose bones were also brought in trunks, with flames painted round them; and the rest of the figures represented those who having escaped the hands of the Inquisition, were outlaws. These figures were placed at one end of the amphitheatre. After these there came twelve men and women, with ropes about their necks and torches in their hands, with pasteboard caps three feet high, on which their crimes were written, or represented, in different manners. These were followed by fifty others, having torches also in their hands and cloathed with a yellow sanbenito or great coat without sleeves, with a large St. Andrew’s cross, of a red colour, before and behind. 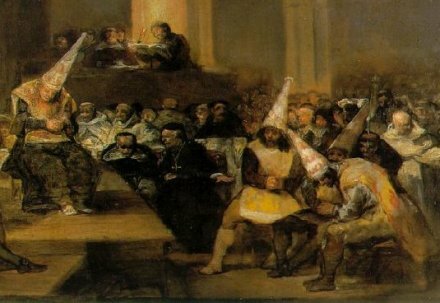 Detail view (click for the full image) of a Goya painting of Inquisition prisoners in the sambenito. 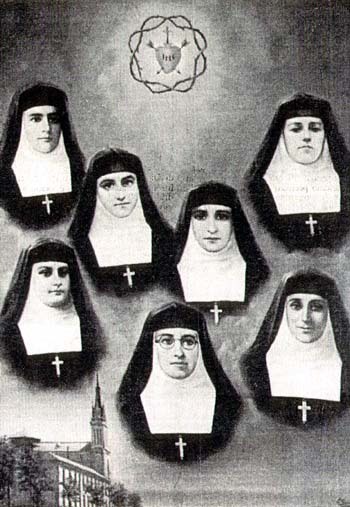 These were criminals who (this being the first time of their imprisonment) had repented of their crimes; these are usually condemned either to some years imprisonment or to wear the sanbenito, which is looked upon to be the greatest disgrace that can happen to a family. Each of the criminals were led by two familiars of the Inquisition. Next came twenty more criminals, of both sexes, who had relapsed thrice into their former errors and were condemn’d to the flames. Those who had given some tokens of repentance were to be strangled before they were burnt; but for the rest, for having persisted obstinately in their errors, were to be burnt alive. These wore linen sanbenitos, having devils and flames painted on them, and caps after the same manner: five or six among them, who were more obstinate than the rest, were gagged to prevent their uttering any blasphemous tenets. Such as were condemned to die were surrounded, besides the two familiars, with four or five monks, who were preparing them for death as they went along. About twelve o’clock they began to read the sentence of the condemned criminals. That of the criminals who died in prison, or were outlaws, was first read. Their figures in pasteboard were carried up into a little scaffold and put into small cages made for that purpose. They then went on to read the sentences to each criminal, who thereupon were put into the said cages one by one in order for all men to know them. The whole ceremony lasted till nine at night; and when they had finished the celebration of the Mass the King withdrew and the criminals who had been condemn’d to be burnt were delivered over to the secular arm, and being mounted upon asses were carried through the gate called Foncaral, and at midnight near this place were all executed. Francisco Ricci‘s grand painting of the Madrid auto de fe represents events from throughout the day simultaneously. Image from Wikimedia Commons. As best I can determine, two condemned people bought their lives with last-second conversions, leaving 18 to die for Judaizing … or, in one case, for converting to Islam. It will suffice to say that a very large, very ornate, and very long ceremony unfolded, and that at the end of it the flames consumed a number of people (and even more mannequins) associated with the Abrahamic faith. 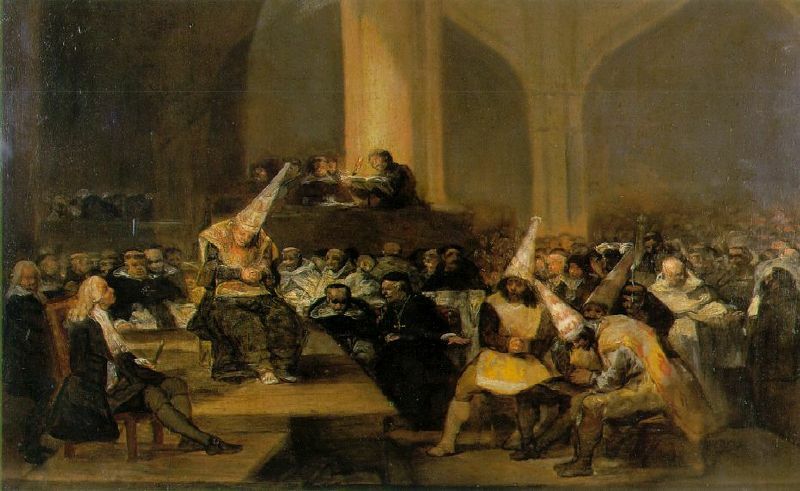 “These punishments,” observed a French diplomat who witnessed the proceedings, “do not significantly diminish the number of Jews in Spain and above all in Madrid where, while some are punished with great severity, one sees several others employed in finance, esteemed and respected though known to be of Jewish origin.” Actual eliminationist Jew-hunting was so 1492. Great as were these astounding spectacles, their day was passing. In fact, this was it — the long, sweltering, tiresomely gaudy day that it passed. Spain in 1680 was in the grip of plague, famine, and deflation; though there’s value to the state in the distraction of a circus, there’s also the very substantial cost of putting the bloody thing on, especially on such a scale, especially when you’re going to let off most of the victims but not until you sock them away in prison and feed them for months or years until the next auto. 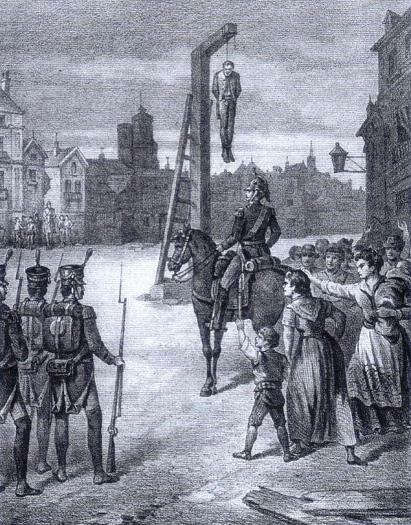 It seems that by the 17th century this end-zone spike of the Inquisition had become quite an encumbrance: procedures required the Inquisition to dispose of certain cases in autos de fe, which, because they had to be put on just so, were increasingly rare, and clogged up gaol cells in the meanwhile. 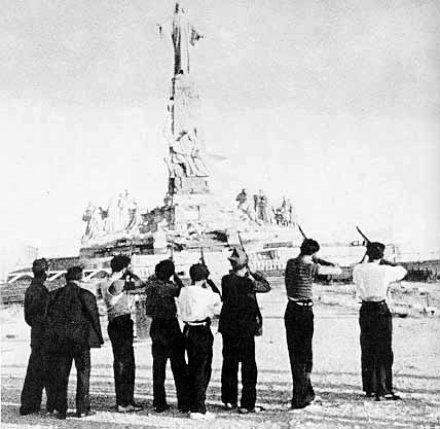 There’s a reason besides spectacle that all the rest of Spain gratefully dumped its religious criminals on Madrid on this date. The model just wasn’t sustainable. Over the 1680s, practical pushback reconfigured the venerable ritual into something less burdensome to the public purse. This date’s event was very far from the last auto de fe in Spain, but it’s seen as the last of the classic, public-festival spectaculars evoked by the term. They would, in the future, become (mostly) smaller, (usually) shorter, and (somewhat) less garish affairs conducted not on public plazas but on church grounds, and with most cases of reconciliation simply handled quickly, quietly, and locally. 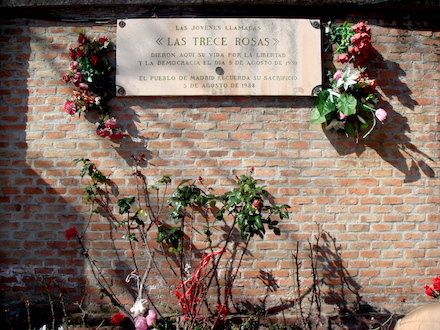 On this date in 1823, Rafael Riego was hanged in Madrid. 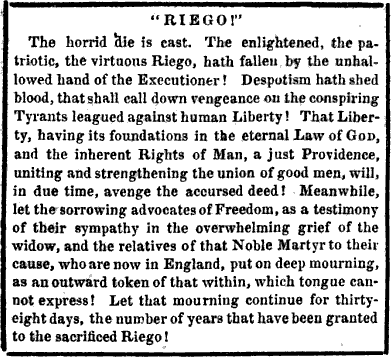 Riego was a leading exponent of the supine cause of Spanish liberalism during the 1810s reign of the feckless Ferdinand VII, who had reversed Spain’s extraordinarily progressive 1812 constitution. On the first day of the 1820s, he led an army mutiny that forced the king to restore that constitution. 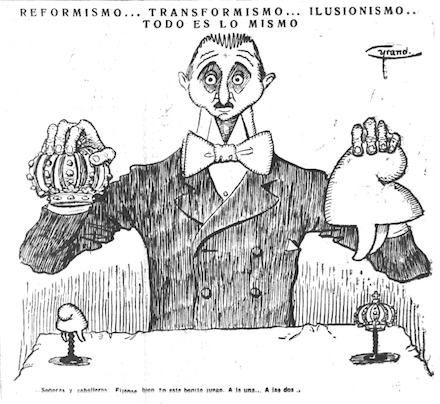 Feckless Ferdinand went along with the new sheriff, and the result was a three-year interregnum of constitutional government — the Trienio Liberal. But the Bourbon king was only too pleased to solicit the aid of Europe’s counterrevolutionary monarchs. 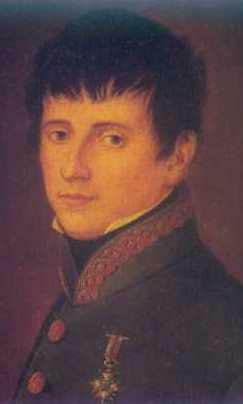 In 1823, a French expedition — the “hundred thousand sons of St. Louis — invaded Spain at Ferdinand’s invitation and swiftly crushed Riego’s liberals. Then Ferdinand crushed Riego himself. Induced like Cranmer to sully his reputation by recanting in the vain hope of a pardon (and by starvation and other coercions), Riego was instead stripped of military honors, given a summary trial, and ignominiously drug to the gallows in a basket. Post-Riego, Spain’s liberal and absolutist factions still had years of bloody fighting and martyr-making yet to go. And we’re not just talking 19th century. 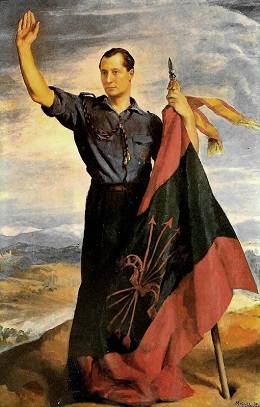 There’s a Himno de Riego, which was also the anthem of the 1930s Spanish Republic that Franco laid low.